Ecuador’s new constitution was passed yesterday by about 65% of Ecuador’s voters. This shows a pretty good representation since Ecuador’s law requires that every citizen vote. The Ecuador constitutional and voting system makes it pretty hard for a minority to elect a president (as has happened in the USA). I believe that this is further reason to take advantage of the great Ecuador beach condo savings since is the last day of the offer for Ecuador Living subscribers. See Ecuador beach condo final. This will be the third Ecuador Constitution that Merri and I have seen since we have been investing and living in Ecuador. The last constitutional change was promoted by a corrupt president. That change did him little good once he failed to deliver on his promises. The Ecuadorian people have peaceful ways of throwing out bad presidents. Ecuador has not experienced the violence and repression characteristic of other Latin American military regimes. Yet Ecuador has a history of fast presidential turnover and had 48 presidents during the first 131 years of the republic. When Merri and I arrived in Ecuador, Sixto Duran Ballen was President and a presidential election was near. In 1996 Abdalá Jaime Bucaram won that election beating Jaime Nebot. But Bucaram lasted less then six months and has been followed by Fabian Alarcón, Jamil Mahuad, Gustavo Noboa, Lucio Gutiérrez, Alfredo Palacio and now Correa. So we have seen eight Ecuadorian presidents come in just over a decade….and seven go…since 1996. When Correa stayed at our hotel, I suggested we put up a sign saying “Ecuador’s Presidente Slept Here”. The staff suggested we make it a sign that could easily have the name changed. However, as I have written numerous times before, Ecuador’s President Correa May be Good. See why here. Ecuador’s political scenario is similar to that of the US, a young, obviously bright…ambitious, though inexperienced man is promising to change a broken corrupt system. Correa has made some strong promises. Can and will he fill them? We’ll see, but I have doubts. What politician do you know that has kept all of his or her promises? Political systems have a way of entangling and diluting goals, good or bad and even worse…corrupting them. Correa is obviously bright. He worked his way from poverty to receive a Master’s degree in Economics from the Université Catholique de Louvain (Belgium). He then obtained a Ph.D. degree in Economics from the University of Illinois at Urbana-Champaign (United States) in 2001. Werner Baer is an economist well known for his research on Latin America’s industrialization and economic development. Baer’s analysis of Latin American economic development’s view is as important as Latin economic literature and he is a highly influential in this field. He has been responsible for establishing one of the largest networks of those interested in the economies of Latin American. Let’s hope that Baer is correct in his assessment of Correa. As, with the changes ahead in the US…we’ll see. As business people in the US, Ecuador or wherever…we adapt. The change creates opportunity. To date none of the political changes…non of the numerous past presidents over the past 12 years, non of the crisis in Ecuador have made any great difference in our business in Ecuador at all. 911 in the US was devastating to our Ecuador business…yes (nobody traveled for awhile). The 1998 US stock market boom slowed our business…yes (people were too busy getting rich up here). The 2008 global economic collapse has sent our Ecuador business skyrocketing up …yes (people are looking for a new better life – for less). Something bad must be going on in New Zealand…… yes (we have record numbers of NZ citizens packing up and joining us in Ecuador). Yet nothing political…nor the volcanoes or bank shut downs have stemmed the tide of people coming to Ecuador. The ebb and flow of our business in Ecuador of almost a decade and a half has been all pushed and pulled by external affairs. I have written to numerous Ecuadorians across Ecuador, in many walks of life to see how they feel. I have asked their opinion of the new constitution. We’ll share what we receive here. Until then, here are a few thoughts of my own. Preliminary results showed almost 70% approval of the new constitution. So much progress is hindered by partisan politics, so I like this unity. Right or wrong at least the people are moving in a direction and this will expand horizons…provide experience, joy, pain and grief to help the nation’s evolution. This majority also seems like a protection to me as well. If Correa does not perform up to snuff there will be a strong majority who feel let down…a formula that has not bode well for previous Ecuadorian presidential failures. Correa appears to be strong and moderate. The press all too often note Correa as an ally of the socialist regimes in Venezuela and Bolivia. A close look however shows that his reforms are much less radical than those of Hugo Chávez or Evo Morales. A strong moderate with strong market understandings has produced great results in other small countries such as Chile and Singapore. Would this not be fantastic to have been in at the beginning of these great economies? What a ride up! Correa is not a military man. So many reformers in other Latin countries rose through the military. So it is understandable that they used the military to sustain their power. Correa is a trained economist. He received his first economics degree at the Universidad Catolica Santiago de Guayaquil in 1987. Following his degree, he worked for a year in a mission at a welfare center run by the Salesian order. It stands to reason that Correa will turn more to economics, humanitarianism and philosophy than muscle to sustain power. The new constitution aims to help the poor. Many people worry about the left wing tendencies of the new constitution. Too much socialism is bad. Yet the fact is every capitalistic society to date has agreed that some amount of socialism is good. Europe has plenty of it. Canada and England do as well. The US is seeing one of the largest socialistic exercises in the history of mankind (the bail out). Everything about success in society is balance. In Ecuador the distribution of wealth is one of the worst in the world. Ecuador’s poor need more help. Merri and I personally have worked to help create employment that helps the poor in Ecuador through our Land of the Sun Foundation. The ideas behind Ecuador’s new constitution are good including a guaranteed free education including university, increased spending on health care, low-interest micro-loans, building materials for first-time homeowners and free seeds for growing crops. These are all benefits that most advanced societies offer so let’s hope that this element of the constitution succeeds and will actually help! Ecuador’s new constitution has an incredibly vital first, a portion granting inalienable rights to nature. We can argue capitalism versus socialism, left versus right till the cows come home. None of there concepts matter much if the global population all dies or civilization falls apart from pollution. The struggle between the last millennium’s concepts of production and consumption and the one society needs to sustain the global population is the most vital of all. How nice it is that this first step to recognizing that we are part of nature comes from the center of the world. If we kill nature we kill ourselves! I suspect that economic realities in such a turbulent country and turbulent global economy will limit the impact of this new language, but at least this is a start…a first step…the first logical shout. The wording alone is fascinating, as is the fact that the provisions were included. This reflects the deep balanced nature of the people in Ecuador…a reality I find very comforting and encouraging when there. My hat is off to the Constitutional assembly for this one. Correa is granted greater control over the central bank, the army and can stand for two more consecutive terms. If Correa does a good job, this is fine, but I believe the maxim that “power corrupts.” I hate to see the loss of the two term limit. Ecuador’s Constitution reduces the separation of powers. I feel same same as above. Overall, this feels good to me. Correa has been criticized for his tough stance with oil companies. Yet I have few doubts that the oil companies deserve criticism as well. Correa says he plans to pass a new law that will regulate mining and attract investment. So we’ll see. Can a balance be achieved…one fair for big business, the poor of Ecuador and the environment? That is a huge task to achieve and I wish him luck. The mainstream press make many unflattering comparisons between Correa and presidents of Bolivia and Venezuela, but Correa has clearly stated that though these nations are friends, Ecuador is not part of the same political movement. Unlike Venezuela’s Chavez, he has not moved to nationalize utilities such as telecommunications and electricity. Correa has also been criticized for not renewing the lease on the Manta airbase for US anti-drugs missions. Yet US diplomats praise Ecuador’s drug-fighting co-operation. Critics say that Ecuador’s new constitution gives Correa too much control over the economy, as well as the legislative and judicial branches. Correa is promising “rapid, profound change” and the end of a corrupt, discredited political class in the Andean country. I hate the loss of separation of power. I like the promises…if there is a genuine, competent attempt to deliver them. Time will tell. In the meantime I continue to invest more in Ecuador. When I see the potential for all the things that can go right and compare them to what I have seen that can go wrong, the current risk premium leaves me drooling and excited over the value. Merri and I hope to see you there. Join us in Cotacachi at dawn. See condos for $46,000 (plus 2% discount for Ecuador Living subscribers. 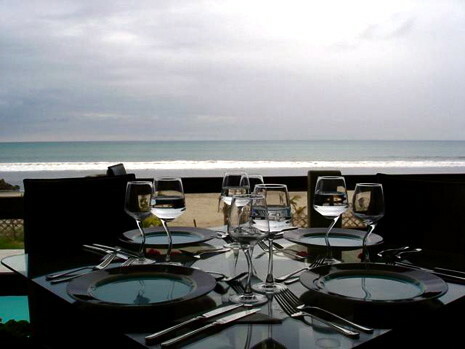 Enjoy Ecuador beach condos with this view for $89,000 with mortgages available. 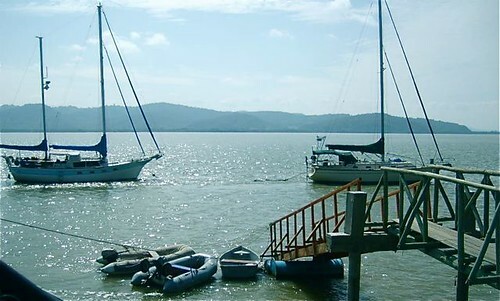 Visit Bahia and see property for sale near the yacht club like this. 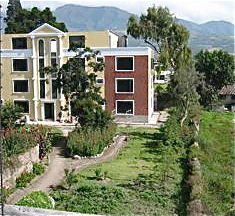 Our September 28-29 Imbabura Real Estate Tour is sold out.